What You Should Know About Your Gear - The Macho Blog. What should you know about your sparring gear? Macho Martial Arts has put together an easy to follow infographic that will help you make sure you’re asking all the questions you should be asking when it comes to staying safe while training. Where is your gear coming from? 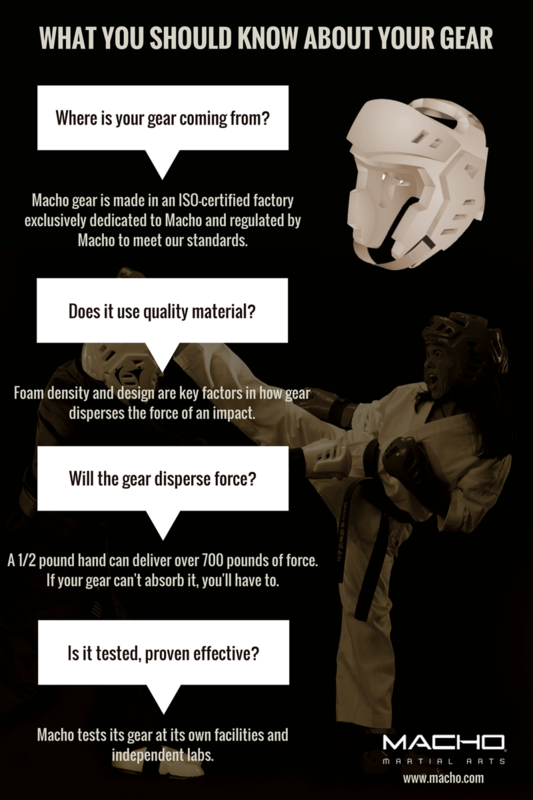 Macho gear is made in a factory exclusively dedicated to Macho and regulated by Macho to meet our rigorous safety testing standards. Macho is a partner in the factory and it is ISO-certified, which means it meets the highest standard for manufacturing expertise. No other big brands are manufactured at our facility. Does it use quality material? Foam density and design are key factors in how gear disperses the force of an impact. The wrong material or poor design could be costly. Quality material and design means your gear will fit securely. If your headgear spins around your head, critical areas could be exposed or injured. Will the gear disperse force or channel it into your body? A 1/2-pound hand can deliver over 700 pounds of force. If your gear can’t absorb it, you’ll have to. Double layer foam protection will provide extra shock absorption for the back of the head and ears, without this adequate padding your body will absorb force and could cause serious injury to the Martial Artist. Is it tested, proven effective? Macho tests its gear at its own facilities and independent labs. We’re not afraid to share our testing information with the consumer. We want every Martial Artist to feel safe when training and by publishing our results you can be confident safety is our number one concern. Macho performs High-Energy Striking Impact Tests on Macho gear. The results demonstrate that wearing Macho gear reduces the level of force that transfers to the body.